Grab a pita stuffed with our delicious hand carved gyro meat, tomatoes, onions and special sauce. It’s amazing by itself or a great start to a value meal. 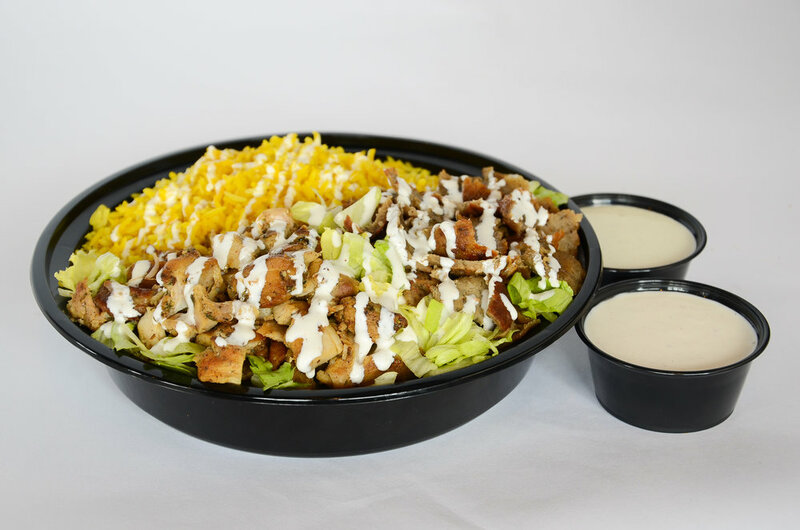 Lighten up with our popular gyro bowl that also has the same hand carved gyro meat plus fresh, crisp lettuce, rice and special sauce. Chicken gyro meat served with basmati rice, lettuce, and your choice of sauce. Lamb Gyro meat served with basmati rice, lettuce and your choice of sauce. Lamb and Chicken Gyro meat served with basmati rice, lettuce and your choice of sauce. Trying to keep it fresh and clean, try out our fresh built to order salads. Choose from a variety of options and dont forget to add our delicious proteins for a nice fill. Romaine lettuce, homemade croutons, and a creamy caesar dressing. Fresh romaine lettuce with walnuts, craisans, sliced green apples and blue cheese served with a pomegranate vinaigrette.